Regnbue (pronounced “rhine-boo”) is the Danish word for rainbow. 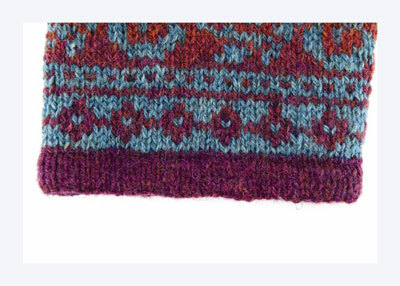 Kauni Effektgarn is a special yarn from Denmark that slowly changes color over the course of yards and yards of yarn. 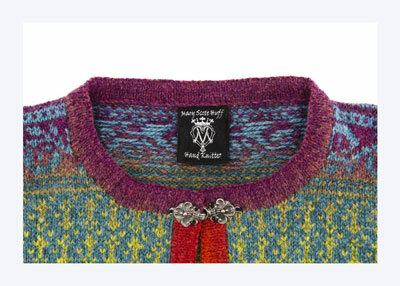 The color changes are the result of the way the yarn is spun, rather than a dye process. 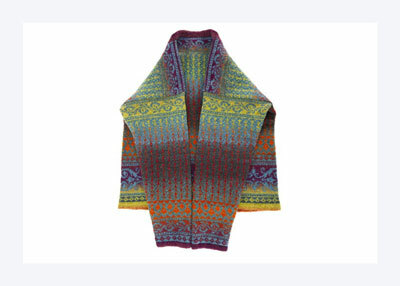 The same two strands of yarn are used for this entire cardigan, without a single manual color change. Just follow the charts, and let the yarn do all the work for you. With smaller 24″ circular needle and CC, CO 270 (280, 300, 310) sts. Work back and forth in St st, (p on WS, k on RS) for 7 rows. Purl 1 row on RS for turning ridge. Change to larger 24″ circular needle and work in St st for 7 rows, knitting in hem on Row 7, if desired. CO 6 steek sts for each armhole and 6 sts for center front and join for working in rnds, being careful not to twist sts. PM at either side of center front steek. 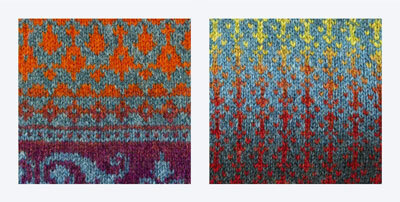 Center front steek sts are excluded from stitch counts. Join MC and work rows 1–53 of Chart A. Work rows 1–29 of Chart B. Rep rows 21–29 until piece measures approximately 20 (20, 21, 21)” from beg. Work rows 1–20 of Chart C.
Sizes 36 and 44 end with a half repeat of Chart C.
Divide live sts by moving from needle to waste yarn as follows: BO 3 sts of center front steek — 23 (23, 24, 26) sts for right front neckline, 43 (45, 49, 50) sts for right front shoulder. BO 6 sts for armhole steek — 43 (45, 49, 50) sts for right back shoulder, 46 (48, 50, 52) sts for back neckline, 43 (45, 49, 50) sts for left back shoulder. 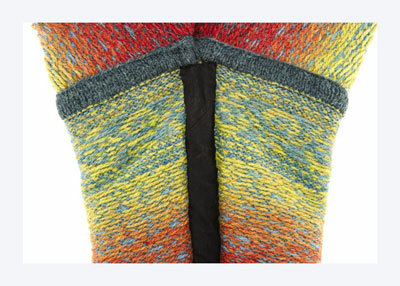 BO 6 sts for armhole steek — 43 (45, 49, 50) sts for left front shoulder, 23 (23, 24, 26) sts for left front neckline. BO 3 sts of center front steek. Make cuff hems: With smaller circular needle and CC, CO 64 (64, 74, 74) sts and work back and forth in St st for 7 rows. Purl 1 row on RS for turning ridge. Change to larger circular needle and St st for 7 rows, knitting in hem on Row 7, if desired. Place cuff on spare needle or waste yarn. Make 2nd cuff to match. Next row (RS): Knit across 64 (64, 74, 74) sts of 1st cuff, PM, CO 6 steek sts, PM, knit across 64 (64, 74, 74) sts of 2nd cuff, PM, CO 6 steek sts, PM. Join for working in rnds, being careful not to twist. Work rows 1–8 of Chart A. Work rows 1–20 of Chart C. Work rows 1–29 of Chart B. At the same time, work inc at each side of each sleeve every 6th rnd, 23 times — 110 (110, 120, 120) sts for each sleeve. Work even until sleeves measure 17 (17, 18, 18)” from turning ridge. Work rows 1–20 of Chart C. (NOTE: Sizes 38 and 40 end with a half repeat of Chart C.) BO steek sts and place live sleeve sts on waste yarn holders. 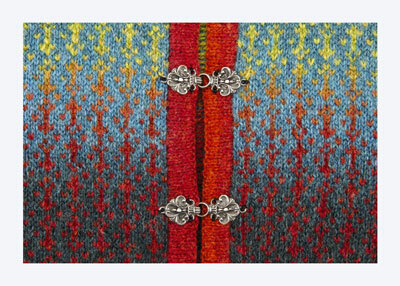 Machine-stitch center front steek. Cut steek and block body. Machine-stitch sleeve steeks. Cut sleeve steeks to separate and block sleeves. Sew sleeves with yarn and tapestry needle, working from RS. 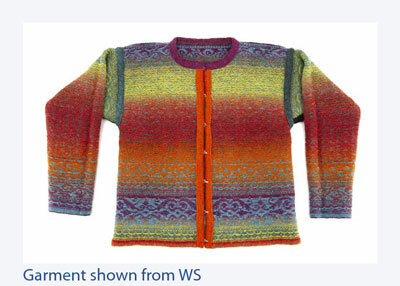 Cover steek edges on WS of sleeve with ribbon or bias binding by sewing in place by hand, invisibly from WS. Measure sleeve from top fold to seam. Measure same distance from top of sweater body at sleeve location. Mark with waste yarn. Machine-stitch armhole steeks and cut. Measure and mark neckline curve to a depth of 3. Cut neckline curve. 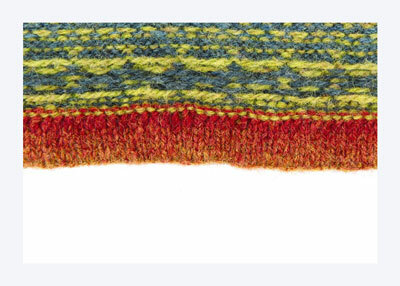 With larger 24″ circular needle and CC, pick up and knit 126 (126, 133, 133) sts along front band, adjacent to steek. Work 7 rows in St st (p on WS, k on RS). Purl 1 row on RS for turning ridge. Change to smaller 24″ circular needle and work 7 rows in St st. BO. Pin binding in place on WS and sew invisibly by hand with thread. Work 2nd front edge binding to match. With larger 24″ circular needle and CC, pick up and knit 43 (43, 44, 46) sts along right front neck edge, 46 (48, 50, 52) held back neck sts, 43 (43, 44, 46) sts along left front neck edge. Work as 7 rows in St st as for front band. Purl 1 row on RS for turning ridge. Change to smaller 24″ circular needle and work 7 rows in St st. BO. Pin binding in place on WS and sew invisibly by hand with thread. Join shoulder seams using 3-needle BO. Remove waste yarn from sleeve top and place on larger 16″ circular needle. Purl 6 rnds, inc at beg and end of every rnd. BO loosely. Rep for 2nd sleeve. 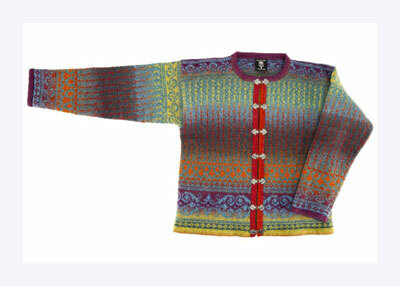 Insert sleeve into armhole and sew in place with yarn and tapestry needle from RS. On WS, pin facing in place over steek and sew invisibly by hand. Rep steps 3–4 for 2nd sleeve. Steam armholes and bands lightly to block. Sew hooks in place on front bands, as shown.